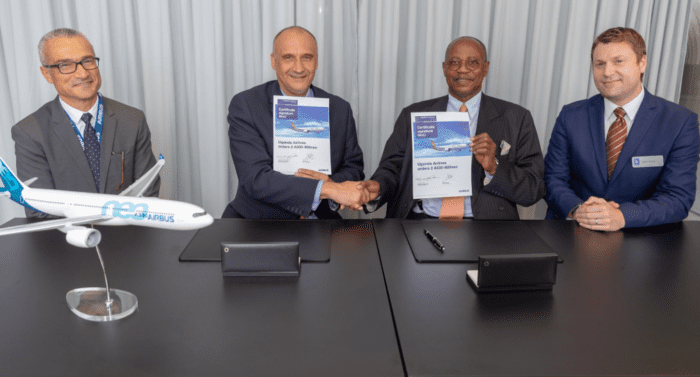 In 2018, at the Farnborough Airshow, Uganda Airlines signed a Memorandum of Understanding with Airbus for two A330-800neo aircraft. Recently, Uganda Airlines firmed their order for two of the smaller A330neo aircraft. 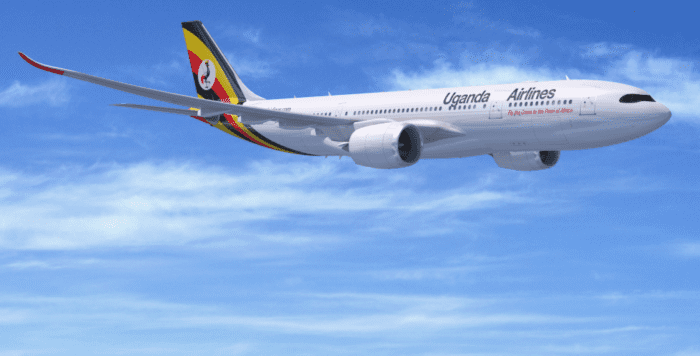 Uganda Airlines ordered two A330-800neo aircraft for their medium- and long-haul routes. The A330-800 has a range of up to 8,150 nautical miles. The A330-800s for Uganda Airlines will be powered by Rolls-Royce’s Trent 7000 engines. Uganda Airlines is one of two customers for the A330-800. Kuwait Airways placed an order for eight of the type. As a result, Uganda Airlines’ order brings the total A330-800 aircraft on order to 10. For Airbus, this new order does show that there may be some interest in the aircraft. 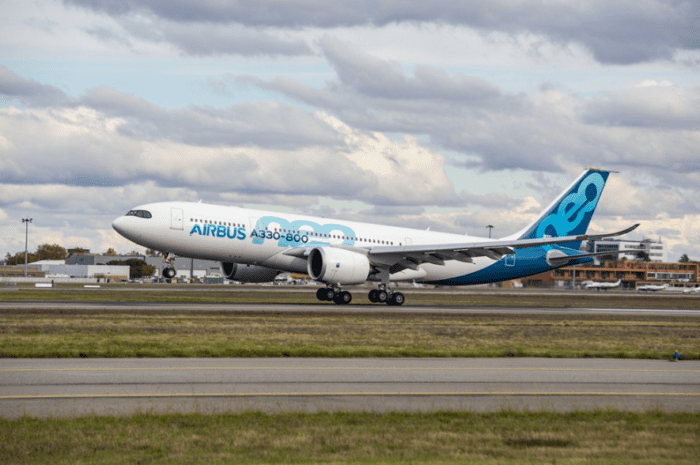 However, Airbus will need to aggressively market and rack up more orders for the A330-800 in order to deem the program successful. As of now, the A330-800 is undergoing testing and has not entered service yet. The larger version of the A330neo, the A330-900, has already entered service with TAP Portugal. North American launch customer, Delta Airlines, will also enter the A330-900 into service soon. According to Airbus, the A330-800 can hold 257 passengers in a typical 3-class configuration. On the other hand, up to 406 passengers can occupy the A330-800 in a high-density configuration. Uganda Airlines has chosen to outfit their A330-800s with 261 passengers in a three-class configuration. The layout accommodates 20 passengers in business class, 28 seats in premium economy, and 213 passengers in the economy cabin. Based on the configuration, it seems like Uganda Airlines would go for a four abreast business class configuration. The reverse herringbone seat fits this kind of description. In addition, a variation Turkish Airlines’ new business class seat could also be an option. Uganda Airlines will perhaps seek lower costs and go for a standardized product rather than introducing a cutting edge, new seat. For premium economy, it seems like Uganda Airlines will choose to fit a comfortable seven seats per row in a 2-3-2 configuration. Meanwhile, in economy, Uganda Airlines’ A330-800 should retain the comfortable 2-4-2 configuration. Towards the rear, where the fuselage narrows, it is likely Uganda Airlines will transition to a 2-3-2 configuration. Regardless, this configuration makes economy class more comfortable than most nine-abreast 787s. As expected, the A330-800 could comfortably fly those routes. Uganda Airlines is the revived version of Uganda’s flag carrier. The airline has ambitious plans as they seek to use their A330 to set up medium- and long-haul operations. To complement these, Uganda Airlines has an order for Bombardier CRJ aircraft that will commence delivery later this month. We can’t wait to see these A330-800 aircraft flying! Would you fly Uganda Airlines? Let us know in the comments below!